William and his son (also William) were the owners of Coley Park estates from 1792-1802. He purchased the estates in 1792 while he was Solicitor to the Treasury and the Mint. The estates later being inherited by his son, also a William. 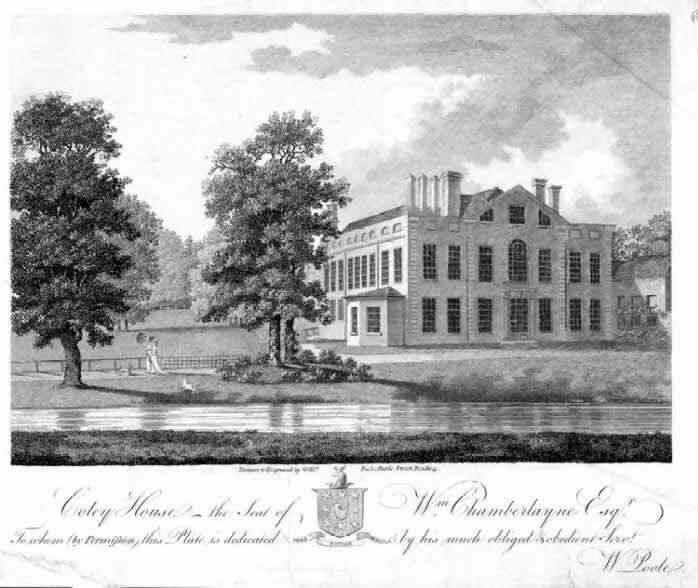 In 1792 the estates also included; Manor at Whitley in Reading, Great Coley Farm and lands, Little Coley farm and lands, Coley Park (46 acres, Lower and Upper Park), Messuage known as Knots in Little Coley, Pinkneys Meadow, two water-corn mills known as Abbey Mills (see note), several messuages and 6 acres of garden ground in and near Castle Street, several tenements on the north side of Castle Street, 5 messuages known as Forlorn Hope in Castle Street. This drawing of 'Coley House' dated around 1795, is believed to be the last, but vastly modified, reincarnation of the original 'Vachell House' of c1555 located close to the banks of the Holybrook rivulet which was subject to winter flooding. The above image of Coley House is believed to be the original (but rebuilt) Vachell House, which was located near the banks of the Holy Brook stream and adjacent to Coley Farm. The plate drawing was dedicated to W.Chamberlayne Esq. by his much obliged obedient servant W.Poole. Refer to the Coley House page for more information. Note: Abbey Mills are the same mills as first built by the monks at Reading Abbey in the 12th century. Although the Abbey was closed in 1539, these large mills were not destroyed and continued to utilise the Holy Brook stream to turn the grinding wheels for at least another 400 years. Today an old brick arch over the Holy Brook is the only reminder of these once famous mills, located behind Reading's Central Library in King's Road. William Chamberlayne (Junior) inherited the the estates from his father in c1799. He sold the estates to Thomas Bradford in 1802.